If you’re in or have plans for visiting Bangkok, Thailand try their fried cheez balls. I got this picture by e-mail today from a family visiting Bangkok. They found this cheese ball wagon in Patunam, Bangkok. Delicious fried cheez balls as street food/snacks. If you’re just for one night in Bangkok look for this pink cheez ball wagon and buy yourself some fried cheez balls thai style. it’s kind of embarrassing to admit that todays dilemma was choosing among these lovely yellow cheese snacks. I’ll be standing in the corner of SHAME for a while now. But in the end, I decided not to buy anything at all. Instead I bought that magazine our homeless people are selling to earn some money for food or something else they are in need of. I really hope that they spend them wisely in the end. S**t, I’m an addict!!! Addicted to cheez doodles! how do you compare problems, addictions……? 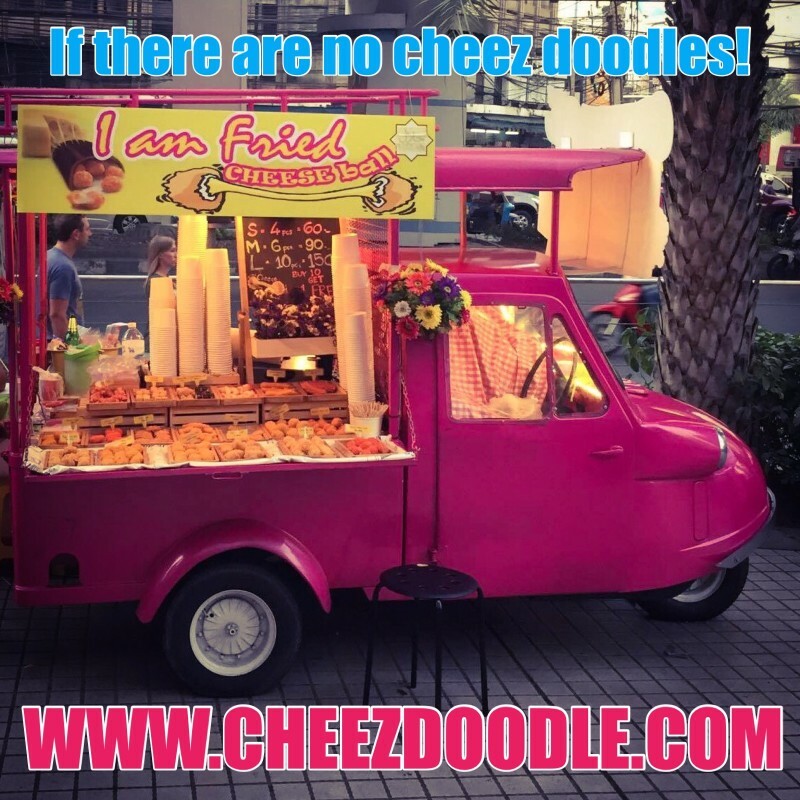 Can you compare a cheez doodle addict with a crack addict? They are both addicts and in the end both substances are drugs theoretically anyway. But I still won’t stop loving and eating my loved yellow ones, never ever…..
One thing is for sure! You have to try this! Cheez doodles goes taste of chocolate. The best part is that you make them yourself in minutes. You just melt your favorite chocolate and dip your doodles in it. 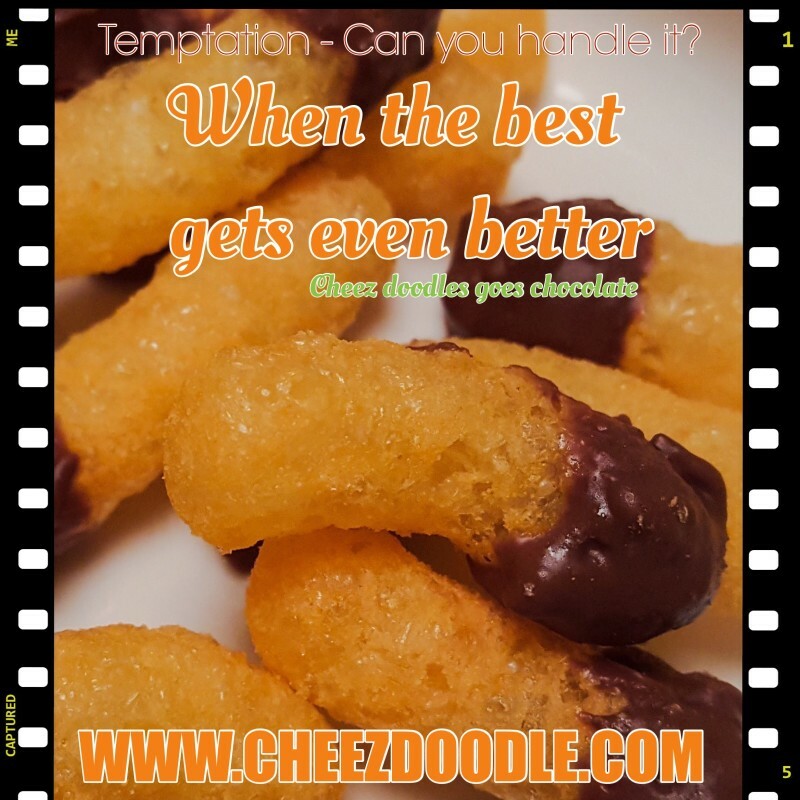 Let them cool for a couple of minutes or more and voila, cheez doodles with a touch of chocolate. Please be careful and don’t get burned while handling the hot melted chocolate.